Obituary – Gillaspy, John George « Perry High School Alumni Association, Inc.
Sophomore class Secretary, Glee club, Blue Curtain Dramatic club, Citizenship Honor Roll. All school play. ﻿John G. Gillaspy, 57; of the Perry area since 1918, died at 1 a.m. Tuesday at his home, one mile west and one south of Perry, following an extended illness. Services will be at 2 p.m. Thursday in the First Baptist church with Rev. Robert E. Lee of Stillwater officiating, assisted by Rev. W. C. Campbell of Sayre. Both are former ministers of the Perry church. Burial will be in Grace Hill cemetery under direction of Newton funeral home. Gillaspy was born April 28, 1911, in Clyde Kan., and came to this area from Kansas in 1918 with his parents, the late Isaac N. and Clara Effie (Stoneback) Gillaspie, who settled on a farm southwest of Perry. 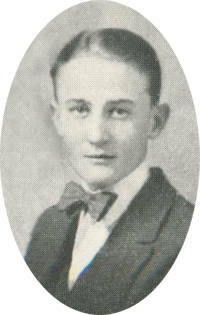 He graduated from Perry high school in 1929 and was a farmer-stockman. He was married Aug. 1, 1933, in Duncan, to the former Tina (Tommie) Alexander, who survives. Gillaspy operated a service station here for several years until about 1958. He was a member of the First Baptist church and served on the board of deacons. He also was a member of A.F. & A.M. lodge No. 78 and the Independent Order of Odd Fellows. In addition to his wife of the home, he is survived by two sisters, Mrs; Glen Albin, Hi-wasse, Ark. ; and Mrs; John Stewart, Albuquerque, N.M.; and a nephew, Jerry Phillips, of the home. A sister also preceded him in death.